Bronze Star with Combat "V"
On Feb. 17, 1994, the Secretary of the Navy announced a new Arleigh Burke class guided missile destroyer would be named for Col. Higgins. The USS HIGGINS (DDG76) was christened and launched on Oct. 4,1997, at Bath Iron Works in Maine. It was commissioned Apr. 24, 1999 in Ft. Lauderdale, and is homeported in San Diego. The USS HIGGINS has won numerous awards and decorations, and was instrumental in Operation Iraqi Freedom. Colonel William R. (Rich) Higgins, USMC, disappeared on Feb. 17, 1988, while serving as the Chief, Observer Group Lebanon and Senior Military Observer, United States Military Observer Group, United Nations Truce Supervision Organization. Born in Danville, Kentucky on Jan. 15, 1945, Rich Higgins graduated from Southern High School in Louisville and earned his bachelor's degree from Miami University, Oxford, Ohio. A scholarship student in the Navy ROTC, he received the Marine Corps Association Award and was commissioned in the Marine Corps in 1967. He later obtained a master's degrees from Pepperdine University and Auburn University. He graduated from the Army Infantry Officers Advanced Course, the Air Force Command and Staff College, and the National War College. 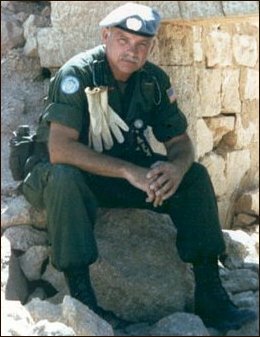 As a lieutenant, he participated in combat operations during 1968 with C Company, 1st Battalion, 3d Marines in the Republic of Vietnam as a rifle platoon commander and rifle company executive officer, and was aide-de-camp to the Assistant 3d Marine Division Commander. 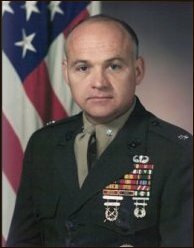 In 1969 Lt. Higgins served at Headquarters Marine Corps and in 1970 as the Officer-in-Charge of the Officer Selection Team in Louisville, Kentucky. From 1973 - 1977, Captain Higgins served at the Staff Noncommissioned Officers Academy and Officers Candidates School, both in Quantico, Virginia. Returning to the Fleet Marine Force in 1977, Capt. Higgins was assigned to the 2d Marine Division at Camp Lejeune, North Carolina, where he again served as a rifle company commander with A Company, 1st Battalion, 2d Marines. Upon promotion to major, he was reassigned as the Logistics Officer for Regimental Landing Team-2, 4th Marine Amphibious Brigade. After completion of the Air Force Command and Staff College at Maxwell Air Force Base in 1980, designated a distinguished graduate, he returned to Washington where he served at Headquarters as a Plans Officer until his selection to the Office of the Secretary of Defense. During 1981 and 1982, he served as Military Assistant to the Special Assistant to the Secretary and Deputy Secretary of Defense, then as Assistant for Interagency Matters to the Executive Secretary for the Department of Defense. After graduation from the National War College in 1985, he returned to the Pentagon as the Military Assistant to the Secretary of Defense, where he served until he was transferred to his United Nations assignment in July 1987. He was promoted to colonel on Mar. 1, 1989. After being held captive by pro-Iranian terrorists in Lebanon, Col. Higgins was murdered. The exact date of death is uncertain; however, he was declared dead on Jul. 6, 1990. His remains were eventually recovered and interred at Quantico National Cemetery Dec. 30, 1991. Col. Higgins' military decorations include: the Defense Distinguished Service Medal, Defense Superior Service Medal, Legion of Merit (posthumous), Bronze Star with combat "V", Purple Heart (posthumous), Meritorious Service Medal, Navy Commendation Medal with bronze star and combat "V", Combat Action Ribbon, Vietnamese Cross of Gallantry with silver star, Staff Service Honor Medal, United Nations Medal, and numerous unit commendations and campaign ribbons. On Mar. 18, 1992, President George Bush awarded Col. Higgins the Presidential Citizens Medal (posthumous). There to accept the medal were his wife, Robin, and daughter, Chrissy. Col. Higgins is also survived by two sisters. In Apr. 2003, after over 10 years of trying to have Col. Higgins recognized as a prisoner of war, he was finally posthumously granted a Prisoner of War Medal.